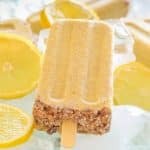 These Creamy Lemon Cheesecake Pops are quick & easy to prepare & full of zingy lemony cheesecake flavour. They are packed with healthy ingredients & perfect for some cool refreshment this summer! Put the pecan nuts, 1 date and a pinch of salt in the blender and process until crumb like cookie crumbs. Take out about ½ and set aside. Leave the rest in the blender. Zest the lemon and add it to the blender, then remove the remaining peel and white pith with a sharp knife (you can see how I do it in my video above). Discard the peel and pith and add the whole lemon to the blender. Pour into ice-pop molds then sprinkle on the pecan crumbs you set aside evenly between them all. Press the crumbs down lightly with a finger so they get embedded a little bit. To remove either hold with a warm hand or dip into a cup or small jug of cold water for a few seconds. They should then pull out easily. There should be plenty to fill most ice pop molds. If you have any leftover eat it. Cooks perks and all that! If you don't have an ice pop mold, paper cups will do. Fill 6 of them evenly and freeze for a little while until you can put the sticks in and they stay in place.